I hope everyone had an amazing 4th of July! I know I did, it was relaxing and it was so much fun. I'll talk more about that tomorrow, and I will also have some great recipes for summer treats to show y'all. I was asked to do a segment on ABC4's The Daily Dish yesterday on low calorie treats for this summer so I'll post that link tomorrow! But today I have an outfit that I absolutely love and its one of my favorites! Not only is it sporting some red, white, and blue but it has paisley which I love. 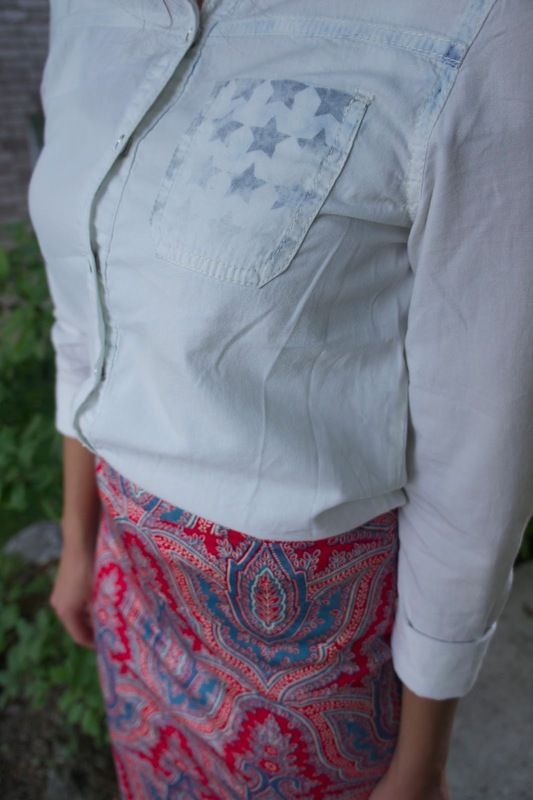 I paired this J.Crew skirt with a white button up with some cute stars on the pocket which to me really made it a casual dressed up look. And I added some hoop diamond earrings to go with my fun heels! Happy Friday Everyone!!! Anyone have some fun weekend plans? And don't forget about the $300 J. Crew Gift Card Giveaway!! You can enter HERE! love the look, your shoes are the PERFECT touch!! You look great! I've always really loved paisley-type patterns, too. And the stars on your shirt pockets are very cute! Okay, you're too cute! Paisley pretty much is amazing...especially red, white, and blue! Love this look! That skirt is so much fun! Those earrings are the perfect amount of bling! 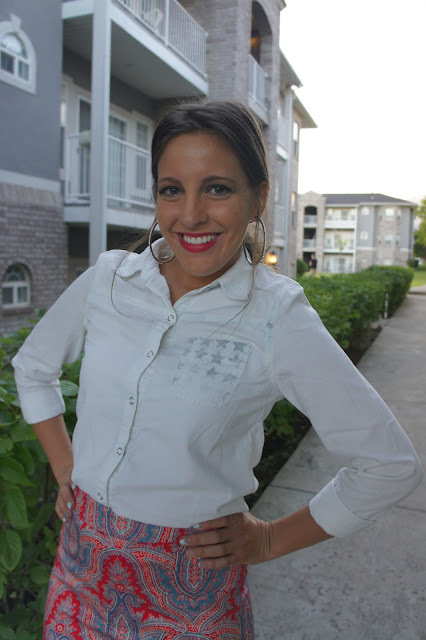 I love how subtle this look is with the stars on the pockets!!! Stopping by from the aloha blog hop! I am now following. I look forward to keeping up with your blog! Hey there! I just wanted to say thank you so much for the follow on Bloglovin'; I'm happy to be following you back :o) Hope you're having a wonderful weekend!